On March 19, 2018, India finally joined European public-private consortium of sharing free, full and open access data from Earth observation satellite constellation, called Copernicus – The European Earth Observation Programme, previously known as GMES (Global Monitoring for Environment and Security). Based out of Europe, it provides a wide range of services and solutions such as climate monitoring, land, ocean, and atmosphere monitoring as well as support in forecasting, management, and mitigation of natural disasters. India has twice made use of its services in the recent years—first when a tropical storm hit Odisha coast in 2013, and when floods hit Andhra Pradesh in October 2014. The agreement was signed in Bengaluru by PG Diwakar, Scientific Secretary in the Indian Space Research Organisation (ISRO) on behalf of the Department of Space, and Philippe Brunet, Director for Space Policy, Copernicus, and Defence, on behalf of the European Commission. Under the pact, the European Commission will provide India free, full and open access data from its Copernicus Sentinel family of six satellites. In return, India will provide the European partners of the Copernicus program - free access to the data - gathered by India's earth observation satellites (Like Oceansat-2, Megha-Tropiques, Scatsat-1, SARAL, INSAT-3D, INSAT-3DR) including historical data sets. However, commercial high-resolution data are out of the ambit of the agreement. The new agreement envisages technical assistance for the establishment of high bandwidth connections with ISRO sites, in particular through setting up of mirror servers, data storage, and archival facilities. Also, India will allow European scientists access to in situ data from its regional observatory networks of geophysical and meteorological data. ISRO will coordinate access to in situ data and promote the use of information and data provided by the Copernicus program with various institutions and government agencies, particularly the environmental sector, academia and the private sector. In the recent times, the Landsat data and Sentinel data across the globe are available free of cost and with ease to access. So, the business opportunity with respect to selling or licensing of data is nearly over. Of course high/very high resolution (VHR) data and to a certain extent microwave, SAR data are available at a cost. Under the Copernicus programme, Sentinel is offering microwave data also free of cost. Since September 2011, ISRO is providing Resourcesat-2/2A LISS-III (Linear Imaging Self Scanner -III) and Advanced Wide Field Sensor (AWiFS) data (with some latency period) and other coarser resolution data at free of cost through Bhuvan portal of NRSC/ISRO. Data/products from Indian meteorological and oceanographic missions have always been free of cost. Earlier this month, Brazil also signed a similar cooperation agreement with the European Commission alongside Chile and Colombia to take part in this initiative. Just like India, Copernicus system had been used in Chile, bolstering efforts to fight a wildfire in the summer of 2017 and to help the government in the aftermath of the 2016 earthquake. According to the latest report, Airbus-operated SpaceDataHighway has begun regularly relaying data from the Sentinel-2A satellite, after the successful end of the commissioning period. This marks the start of the SpaceDataHighway service using all four Copernicus Sentinel satellites. The SpaceDataHighway is the world’s first “optical fiber in the sky” based on cutting-edge laser technology. Satellites will be permanently fixed over a network of ground stations, with the first — EDRS-A — already in orbit. Each day, it can relay up to 40 terabytes of data acquired by observation satellites, UAVs, and manned aircraft, at a rate of 1.8 Gbit/s. 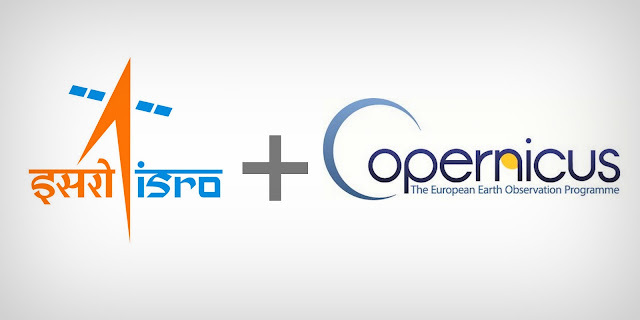 The first two sets of Copernicus Sentinel satellites (-1A/-1B and -2A/-2B) are signed up to this service as SpaceDataHighway’s anchor customers under an agreement between the European Union and the European Space Agency (ESA) as owners of the Copernicus programme, and Airbus as the owner and commercial operator of SpaceDataHighway.